For other uses, see Subtropical (disambiguation). The subtropics are geographic and climate zones located roughly between the tropics at latitude 23.5° (the Tropic of Cancer and Tropic of Capricorn) and temperate zones (normally referring to latitudes 35–66.5°) north and south of the Equator. Subtropical climates are often characterized by warm to hot summers and cool to mild winters with infrequent frost. Most subtropical climates fall into two basic types: humid subtropical, where rainfall is often concentrated in the warmest months (for example Brisbane, Queensland or Jacksonville, Florida), and dry summer climate or (Mediterranean), where seasonal rainfall is concentrated in the cooler months (for example Naples, Italy or Los Angeles, California). Subtropical climates can occur at high elevations within the tropics, such as in the southern end of the Mexican Plateau and in Vietnam and Taiwan. Six climate classifications use the term to help define the various temperature and precipitation regimes for the planet Earth. A great portion of the world's deserts are located within the subtropics, due to the development of the subtropical ridge. Within savanna regimes in the subtropics, a wet season is seen annually during the summer, which is when most of the yearly rainfall falls. Within Mediterranean climate regimes, the wet season occurs during the winter. Areas bordering warm oceans are prone to locally heavy rainfall from tropical cyclones, which can contribute a significant percentage of the annual rainfall. Plants such as palms, citrus, mango, pistachio, lychee, and avocado are grown within the subtropics. 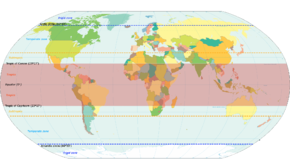 The tropics have been historically defined as lying between the Tropic of Cancer and Tropic of Capricorn, located at latitudes 23.45° north and south, respectively. According to the American Meteorological Society, the poleward fringe of the subtropics is located at latitudes approximately 35° north and south, respectively. Tadrart Acacus desert, part of the Sahara, in western Libya. Several methods have been used to define the subtropical climate. In the Trewartha climate classification, a subtropical region should have at least eight months with a mean temperature greater than 10 °C (50.0 °F) and at least one month with a mean temperature under 18 °C (64.4 °F). German climatologists Carl Troll and Karlheinz Paffen defined Warm temperate zones as plain and hilly lands having an average temperature of the coldest month between 2 °C (35.6 °F) and 13 °C (55.4 °F) in the Northern Hemisphere and between 6 °C (42.8 °F) and 13 °C (55.4 °F) in the Southern Hemisphere, excluding oceanic and continental climates. According to the Troll-Paffen climate classification, there generally exists one large subtropical zone named the warm-temperate subtropical zone, which is subdivided into seven smaller areas. According to the E. Neef climate classification, the subtropical zone is divided into two parts: Rainy winters of the west sides and Eastern subtropical climate. 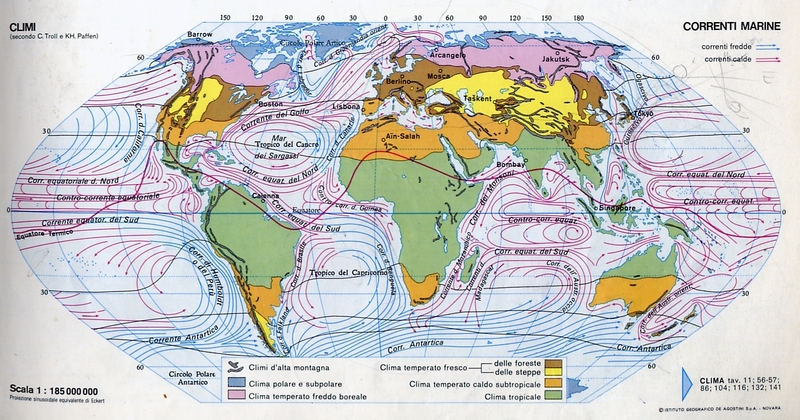 According to the Wilhelm Lauer & Peter Frankenberg climate classification, the subtropical zone is divided into three parts: high-continental, continental, and maritime. According to the Siegmund/Frankenberg climate classification, subtropical is one of six climate zones in the world. 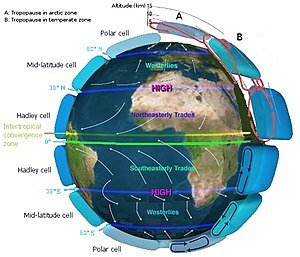 Hadley cells located on the Earth's atmospheric circulation. Heating of the earth near the equator leads to large amounts of upward motion and convection along the monsoon trough or intertropical convergence zone. The upper-level divergence over the near-equatorial trough leads to air rising and moving away from the equator aloft. As the air moves towards the mid-latitudes, it cools and sinks, which leads to subsidence near the 30th parallel of both hemispheres. This circulation is known as the Hadley cell and leads to the formation of the subtropical ridge. Many of the world's deserts are caused by these climatological high-pressure areas, located within the subtropics. This regime is known as an arid subtropical climate, which is generally located in areas adjacent to powerful cold ocean currents. Examples of this climate are the coastal areas of southern Africa (Namibia, South Africa), the south of the Canary Islands and the coasts of Peru and Chile. The humid subtropical climate is often located on the western side of the subtropical high. Here, unstable tropical airmasses in summer bring convective overturning and frequent tropical downpours, and summer is normally the season of peak annual rainfall. In the winter (dry season) the monsoon retreats, and the drier trade winds bring more stable airmass and often dry weather, and frequent sunny skies. Areas that have this type of subtropical climate include Australia, Southeast Asia, parts of South America, and the deep south of the United States. In areas bounded by warm ocean like the southeastern United States and East Asia, tropical cyclones can contribute significantly to local rainfall within the subtropics. Japan receives over half of its rainfall from typhoons. Curitiba, Brazil: Live oak with araucarias. These climates do not routinely see hard frosts or snow, which allows plants such as palms and citrus to flourish. As one moves toward the tropical side the slight winter cool season disappears, while at the poleward threshold of the subtropics the winters become cooler. Some crops which have been traditionally farmed in tropical climates, such as mango, litchi, and avocado, are cultivated in the subtropics. Pest control of the crops is less difficult than within the tropics, due to the cooler winters. Tree ferns (pteridophytes) are grown within subtropical areas, primarily within the subtropics and within topography within the tropics. Dracaena and yucca can grow within the subtropics. Trees within the Taxaceae family grow within subtropical climate regimes. Apple, pear and pomegranates grow well within the subtropics. Wetland Park in Hong Kong. The humid subtropical climate is a subtropical climate type characterized by hot, humid summers with frequent tropical downpours of short duration and warm, and frequently dry winters. In summer, the subtropical high pressure cells provide a sultry flow of tropical air with high dew points, and daily thundershowers are typical, though brief. Normally, rainfall is concentrated in the warmest months of the year. At times, the average annual precipitation may be more evenly distributed throughout the year, or a spring maximum is present. With decreasing latitude most humid subtropical climates typically have drier winters and wetter summers. Humid subtropical climates lie on the lower east side of continents, roughly between latitudes 25° and 35° degrees away from the equator. In the United States, the humid subtropical zone is normally considered the region from central Florida north to northeastern North Carolina. The Mediterranean climate regime resembles the climate of the lands in the Mediterranean Basin, parts of coastal southwestern North America(including western parts of the Pacific northwest), parts of Western and South Australia, in southwestern South Africa and in parts of central Chile. The climate is characterized by hot dry summers and cooler winters with rainfall. In Europe, the northernmost mediterranean climates are found along the French Riviera, located at 43° latitude. On the immediate Atlantic coastline, the mediterranean boundary goes between Porto and Vigo at around 41° latitude. Parts of southwestern Australia around Perth have a Mediterranean climate as does areas around coastal South Africa. Wikimedia Commons has media related to Subtropics. ^ I. G. Sitnikov. "1" (PDF). Principal Weather Systems in Subtropical and Tropical Zones. 1. Encyclopedia of Life Support Systems. ^ Glossary of Meteorology (25 April 2012). "Subtropics". American Meteorological Society. Retrieved 24 March 2013. ^ Belda et al. Climate classification revisited: from Köppen to Trewartha. In: Climate Research Vol. 59: 1–13, 2014. ^ Dr. Owen E. Thompson (1996). Hadley Circulation Cell. Archived 5 March 2009 at the Wayback Machine Channel Video Productions. Retrieved on 11 February 2007. ^ ThinkQuest team 26634 (1999). The Formation of Deserts. Archived 17 October 2012 at the Wayback Machine Oracle ThinkQuest Education Foundation. Retrieved on 16 February 2009. ^ a b "Tropical and subtropical desert climate". ^ Susan Woodward (2 February 2005). "Tropical Savannas". Radford University. Archived from the original on 25 February 2008. Retrieved 16 March 2008. ^ Randy Lascody (2008). The Florida Rain Machine. National Weather Service. Retrieved on 6 February 2009. ^ John J. Stransky (1 January 1960). "Site Treatments Have Little Effect During Wet Season in Texas". Tree Planters' Notes. 10 (2). ^ Geoffrey John Cary; David B. Lindenmayer; Stephen Dovers (2003). Australia Burning: Fire Ecology, Policy and Management Issues. Csiro Publishing. p. 33. ISBN 978-0-643-06926-8. ^ Whipple, Addison (1982). Storm. Alexandria, VA: Time Life Books. p. 54. ISBN 978-0-8094-4312-3. ^ Remote Sensing for Migratory Creatures (2002). Phenology and Creature Migration: Dry season and wet season in West Mexico. Arizona Remote Sensing Center. Retrieved on 6 February 2009. ^ J. Horel (2006). Normal Monthly Precipitation, Inches. Archived 13 November 2006 at the Wayback Machine University of Utah. Retrieved on 19 March 2008. ^ D. Bozkurt, O.L. Sen and M. Karaca (2008). Wet season evaluation of RegCM3 performance for Eastern Mediterranean. EGU General Assembly. Retrieved on 6 February 2009. ^ Ron Kahana; Baruch Ziv; Yehouda Enzel & Uri Dayan (2002). "Synoptic Climatology of Major Floods in the Negev Desert, Israel" (PDF). International Journal of Climatology. 22 (7): 869. Bibcode:2002IJCli..22..867K. doi:10.1002/joc.766. Archived from the original (PDF) on 19 July 2011. ^ Walter Tennyson Swingle (1904). The Date Palm and its Utilization in the Southwestern States. United States Government Printing Office. p. 11. ^ Wilson Popenoe (1920). "Manual of Tropical and Subtropical Fruits: Excluding the Banana, Coconut, Pineapple, Citrus Fruits, Olive, and Fig". Nature. 108 (2715): 7. Bibcode:1921Natur.108Q.334.. doi:10.1038/108334a0. hdl:2027/hvd.32044106386147. Retrieved 24 March 2013. ^ R. K. Kholi; D. R. Batish & H. B. SIngh. "Forests and Forest Plants Volume II – Important Tree Species" (PDF). Encyclopedia of Life Support Systems. Retrieved 9 April 2013. ^ Michael Ritter (24 December 2008). "Mediterranean or Dry Summer Subtropical Climate". University of Wisconsin–Stevens Point. Archived from the original on 5 August 2009. Retrieved 17 July 2009. ^ "Victoria Gonzales HTS, British Columbia". Canadian Climate Normals 1971–2000 (in English and French). Environment Canada. 19 January 2011. Retrieved 15 February 2013.